hey everyone, I am just making this thread for some tips and tricks. I am not going to begin this swap until about November, but I am getting everything ready. Currently the original engine in my G1 runs, and quite well at that since I put a much needed new piston and rings in it. This thing is 100% stock or original, less a Suzuki 200 marine fuel pump and coil because I had them laying around and my parts went bad. I replaced the carb with a stock original one a couple years ago but this cart has been unstoppable and super reliable! I'm doing this because my buddy sold me a whole SRV540 less a track for very cheap. Now, I have read up on some of you guys' threads either involving a G1 or an SRV 540. Awesome stuff!! I know I can get it to run forward and reverse to maintain my original starter/generator and key ignition. I know about the governor spring thingy in the rear (which I need to take apart to positrac it up). The other thing which isn't super important but it would be very convenient is, hooking up the speedometer. I haven't looked at how it connects on the sled yet (still have to go pick it up) so I'm pretty much wondering if that's a possibility. Use the sled clutch. Its calibrated for the rpm of the engine. Will it be okay to use in reverse as well? It has begun! I went and grabbed the SRV540 yesterday and did some tearing down on it. It'll be a slow process, as it is at my permanent camper two hours away as is the cart. 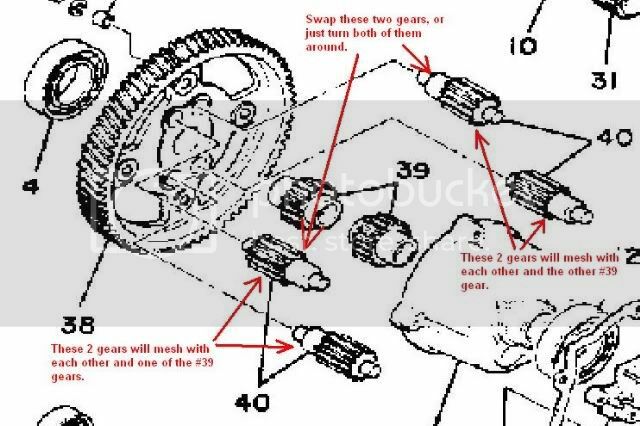 Next weekend the engine comes out of the sled, and I am having "custom" front control arms made by combining Kawasaki Bayou 220 control arms with the factory G1 ones so I can have a wider track as well as front brakes. I am going to keep the G1 together as long as possible, as I do actually use it a lot when I am there. But so far this seems to be a smooth and somewhat easy swap! I will be using the 540 engine with most of the G1's electronics and starter/generator so I can use it as a regular golf cart when need be. Here are a couple pics I grabbed. All stripped and ready for the engine to come out! That should have some power, I think the SRV I had long ago would do low 80s. Had a nice pipe for it too but finally had to let it go. I have a EX440 but no cart to put it into, no track to put on the sled lol. I have no idea what to expect speed wise with this thing, but I will be yanking the governor spring and having the diff welded. I'm also going to make it as quiet as possible, but maybe run an exhaust dump after the stock muffler for when I really want to open it up! Posi = chevy branded limited slip differential, so does it give limited slip or locks the rear? Awesome pic Rib, I never would have thought about that. But that does bring up a good point... Does it simply lock the rear fully or will it give it a limited slip affect?